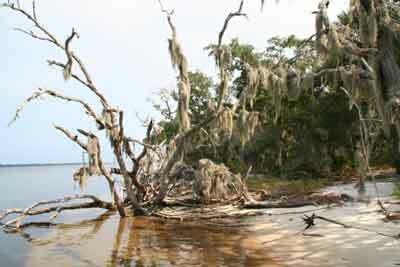 Shell Island is an undeveloped barrier island, which lies between the Gulf of Mexico and St. Andrews Bay. It is located in Bay County, Panama City Beach, Florida. 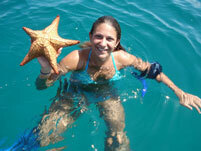 It is where our dolphin tours and dolphin swim tours take place. The island’s pristine beauty and marine environment make Water Planet’s eco-tours an enjoyable and exciting way to experience dolphins in their natural habitat. 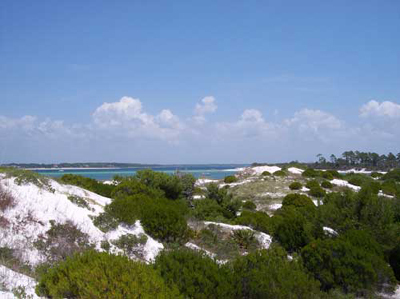 If you wish, you will have the opportunity to explore Shell Island and the back bay, where you will be able to wade or snorkel on the shoals where most grass beds are. The sea-grass beds are where most marine life starts. It is a nursery and the bottom of the food chain. You will be able to collect seashells and to watch wild birds and game. 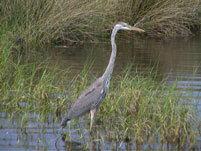 Shell Island is a nature preserve, a bird preserve and sanctuary, a perfect place for bird watching. Our eco-tours will take you to Shell Island where you will be able to observe several species of marine birds and other wading birds like egrets and blue herons. In the warm emerald-colored waters of Shell Island Nature Preserve, dolphins initiate contact with humans. These marine mammals are wild and free and have established a privileged relationship with human beings. Environmental awareness is one of Water Planet’s wild dolphin encounters programs’ main objectives. 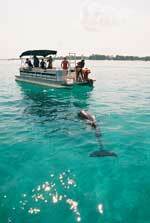 Dolphins and other marine life, the fauna and flora found on Shell Island form what is called an ecosystem. Each organism has its own specific place and function in the environment as a whole while interacting with the other elements. The good health of one is dependant on the good health of the other. 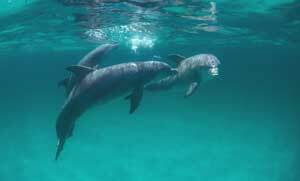 Dolphins are at the top of the food chain and are a good indicator of the health of their environment and therefore of ours as well. Understanding and respect are the corner stones of wild life protection and conservation. Respect is letting grow and letting be; from the smallest and seemingly most insignificant to the largest manifestation of nature. And that includes respecting oneself as well. During the course of our “expeditions”, we will do our best to introduce you to the animals and to the plant life that live on and around Shell Island. Derived from the Latin and the Greek: Calli, beautiful; nectes, swimmer; and, sapidus, savory. Literally: the beautiful, savory swimmer. 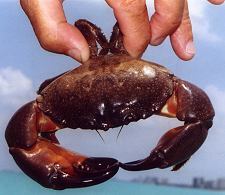 It is the most common edible crab in Florida. 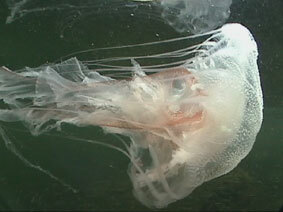 It can be found in bays and estuaries in shallow brackish water between the tide line and about a 100 feet of depth. 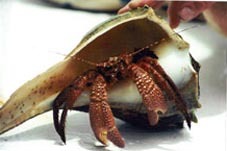 Males have blue tipped claws and females orange tipped claws. You can also tell a male from a female by the shape of their abdomen (skinny and obelisk shaped for males and domed shaped for females). They have 4 pairs of legs and 1 pair of sharp claws. 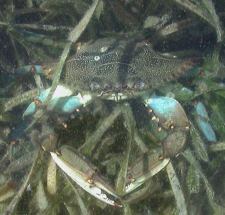 After mating with the male, the female crab will fertilize her own eggs and spawn. 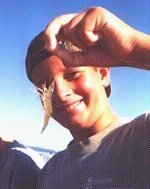 To learn most everything there is to know about blue crabs, visit the Blue Crab Info Site. Is called ghost because its sandy colour makes it difficult to see. It is very fast, feeds at night, seems to appear out of nowhere and vanishes all of a sudden. Ghost crabs live in burrows on the beach. They stay in their holes for the winter months. They become active at nightfall and run along the beaches to wet their gills. Though they live in the sand out of the water, they don’t breath air directly and need access to the seawater in order to survive. 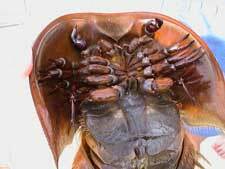 They can produce 3 sounds: a rapping of the claw on the substrate, a rasping stridulation of the legs, and a bubbling sound presumably produced from the gill chamber. Combat between males is highly ritualized and rarely ends with contact. 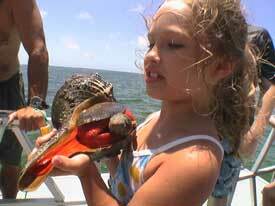 Has been Florida’s official state shell since 1969. It is not a conch but belongs to the tulip family. 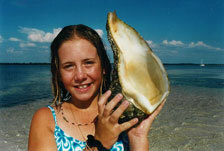 It is the largest conch in the world (sometimes reaching 26 inches long). The Horse Conch will eat any mollosk including its own kind, but it especially likes to feed on pen shells. Horse conchs live in sandy grass flats where pen shells are numerous.Mature Horse Conchs are very popular with shell collectors. 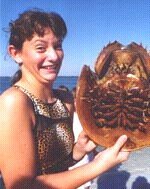 A large shell can fetch up to $100.00. Needless to say that these animals are subject to persecution because of the market value of their shells. The sand dollar is a hard shell with very little live tissue. The five small holes around the center on the top side are called “gonopores”. The live animals emit sperm or eggs into the water through these holes. The flower pattern on the top side is created by a series of very small slits more clearly visible on the dead shell. When the animal is alive, tiny appendages extend through the small openings to exchange gases with the water. This is how it breathes. The five large slots are called “lunules”. They help with burrowing by letting the sand go through. They also allow food particules settling on top to be passed down to the mouth. The teeth are arranged in a starlike pattern and guard the mouth opening. This chewing system is called “Aristotle’s Lantern”. Just like the top, the underside of the sand dollar is covered with small spines moving together in a wave-like pattern. They are used to move around and to dig into the sand. 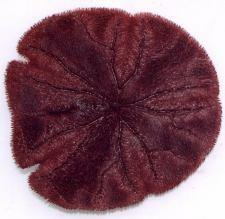 Alive, sand dollars are dark brown or purple in color. When they die, the tiny spines fall off and the dead shell turns white. Sand dollars, sea urchins and starfish all belong to the family of Echinoderms. The starfish’s body is built around 5 points like all the other echinoderms. 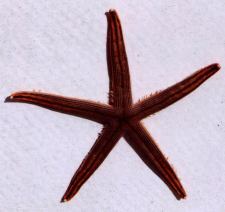 Starfish have neither head nor tail; neither right side nor left side. they can move in any direction without turning. Most of them have 5 arms or a number of arms in multiples of 5. On the inside of the arms are tube like feet ending in tiny suction cups. 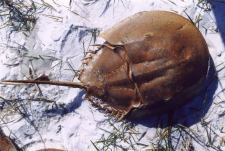 They feed on mollusks like oysters, clams and other shellfish, which they pin down until the shell opens up. Then the starfish stomach comes out of its mouth and penetrates its victim’s shell. The starfish digest its prey on the spot then its stomach retracts back inside through the mouth. 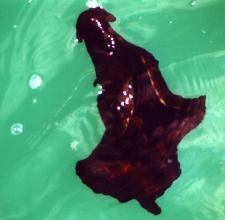 Sea hares look like the big slugs we find in the garden but they live in seawater. Their shell is small and internal. You can often see them by the breakwaters, rocks or seawalls where they graze on seaweed and algae. They swim gracefully with their undulating “wings”, which are in reality the extension of their feet. When upset, sea hares release a jet of ink like the octopus or squid in order to escape under the cover of this dark purple cloud. 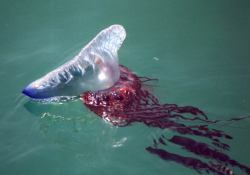 Several types of jellyfish can be found in Florida waters. Most of them will cause a stinging or burn sensation by accidental contact with your skin. Jellyfish are not looking for people to sting them. 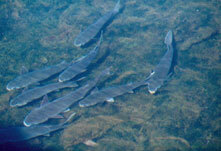 It is a defense mechanism and you can avoid contact by steering clear of them in the water. Should you get stung, ammonia, vinegar or meat tenderizer will usually diminish the pain. Antihistamine may be necessary to keep the swelling down if you have allergic reactions. The Brown Pelican (Pelecanus occidentalis) is the smallest of the eight species of pelican. It is 106 to 137 cm (42 to 54 in) in length, weighs from 2.75 to 5.5 kg (6 to 12 lb) and has a wingspan from 1.83 to 2.5 m (6 to 8.2 ft). 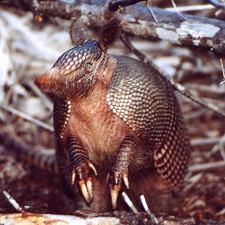 It occurs on coasts in the Americas from Washington and Virginia south to northern Chile and the mouth of the Amazon River. After nesting, North American birds move in flocks further north along the coasts, returning to warmer waters for winter. Their young are hatched in broods of about 3, and eat around 150 lbs. of fish in the 8-10 month period they are cared for. This bird is distinguished from the American White Pelican by its brown body and its habit of diving for fish from the air. 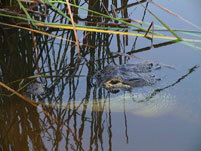 It eats mainly fish and amphibians as well as crustaceans. Groups of Brown Pelicans often travel in single file, flying low over the water’s surface. The nest location varies from a simple scrape on the ground on an island to a bulky stick nest in a low tree. These birds nest in colonies, usually on islands. It is a myth that Brown Pelicans go blind from diving into the water to catch fish, causing them to starve to death because they can no longer see to hunt. Pelicans can live and fish for up to thirty years without going blind. Pelicans can go blind from pollution, abuse and disease, including chemical spills near the coast, fishing line, and avian botulism from tainted fish caught in overly warm water. Pesticides like DDT and dieldrin threatened the Brown Pelican’s future in the southeast United States and California in the early 1970s. Pesticides also threatened the pelican population in Florida in this period. Dr. Ralph Schreiber conducted research in the Tampa Bay/St Petersburg area and found that DDT caused the pelican eggshells to be overly-thin and incapable of supporting the embryo to maturity. As a result of this research, DDT usage was eliminated in Florida and the rest of the country. The Brown Pelican was listed as endangered since 1970 when its numbers dipped to 10,000. The US government remedied the situation by imposing a ban on the use of DDT in 1972. 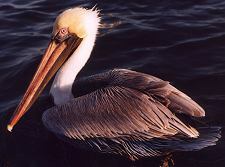 Since then, the population of Brown Pelican had been climbing and was recently removed from the list in November 2009.